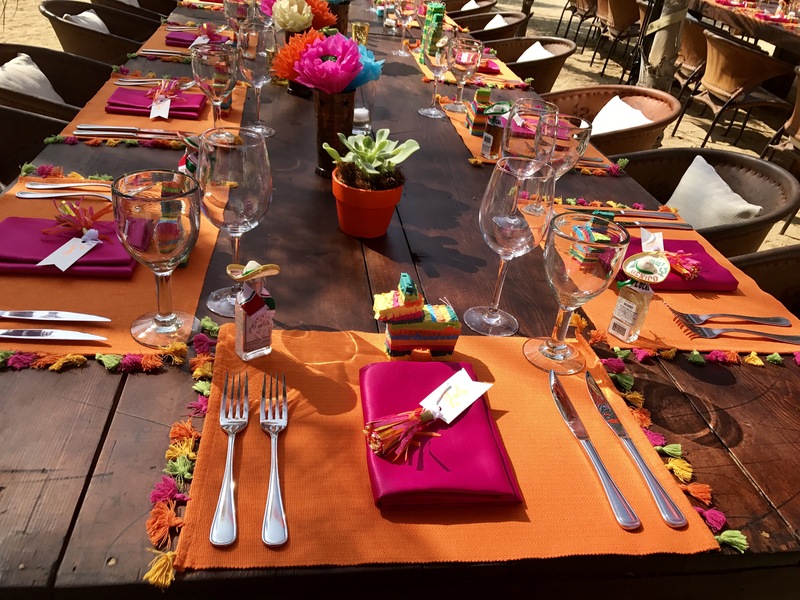 Take a look at this festive, fun & colorful 50th Birthday Celebration!!! 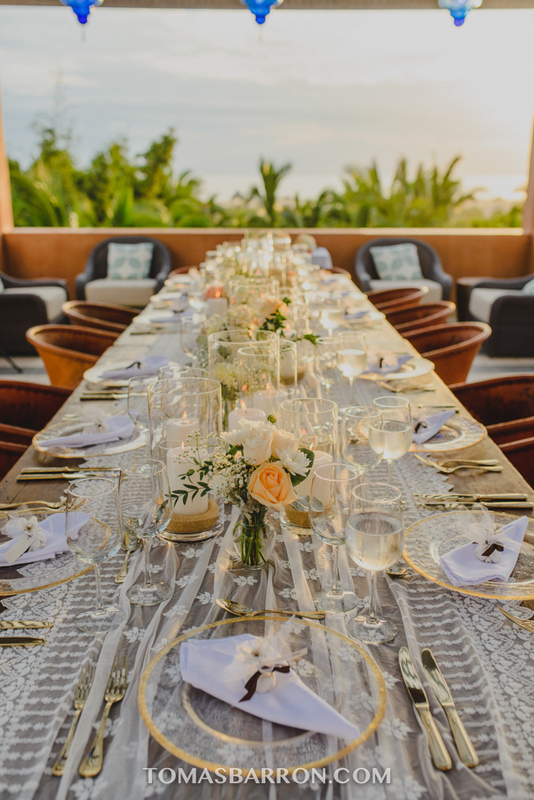 We worked closely with the client’s U.S. wedding planner, Jayne at Just Jayne Events, and the resort planner at Rancho Pescadero, Katie Thompson, to bring the birthday girl’s vision to fruition! 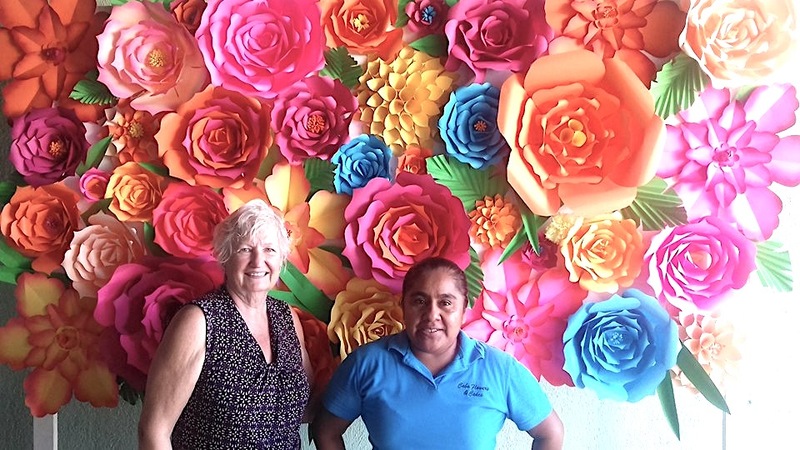 Our client was so thrilled with our paper flower wall, hand-cut and designed by our Donna (on the left) with help from Perla (on the right). This was a photo op location at the entrance to the resort and then provided a back drop for the 3-tier birthday cake. Adding succulents in pots also added a fun element of greenery to the rustic wooden farm tables. 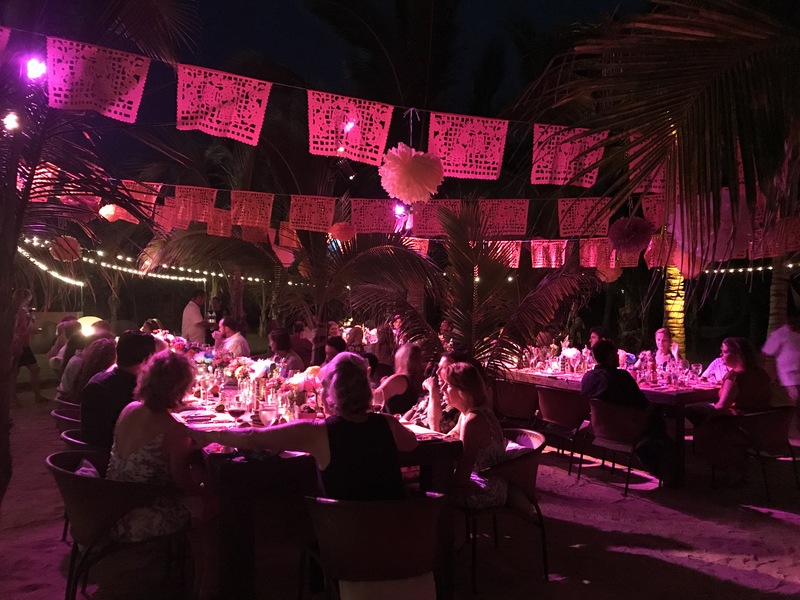 Our flags, and paper flower pom-poms, glowed as the pink & orange lighting shone in the Rancho Pescadero Palm Grove. Celebrate your special milestones in style! 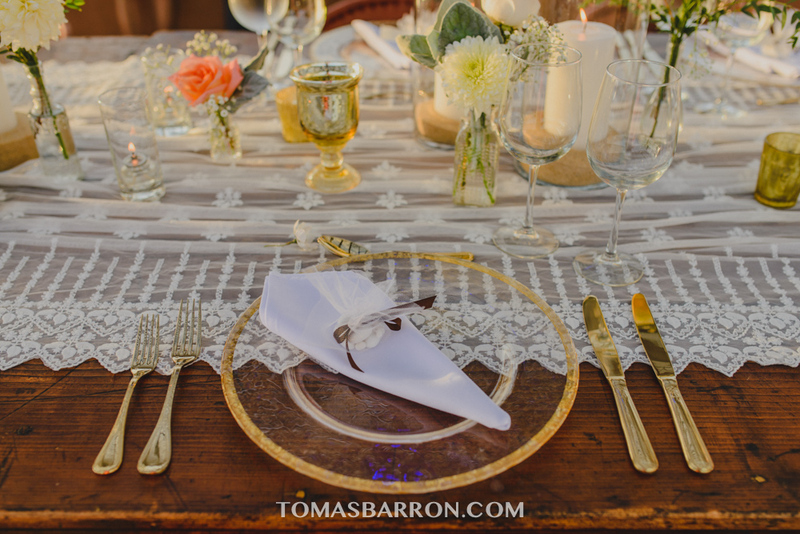 Have fun, and create your dream event, we’re here to help! 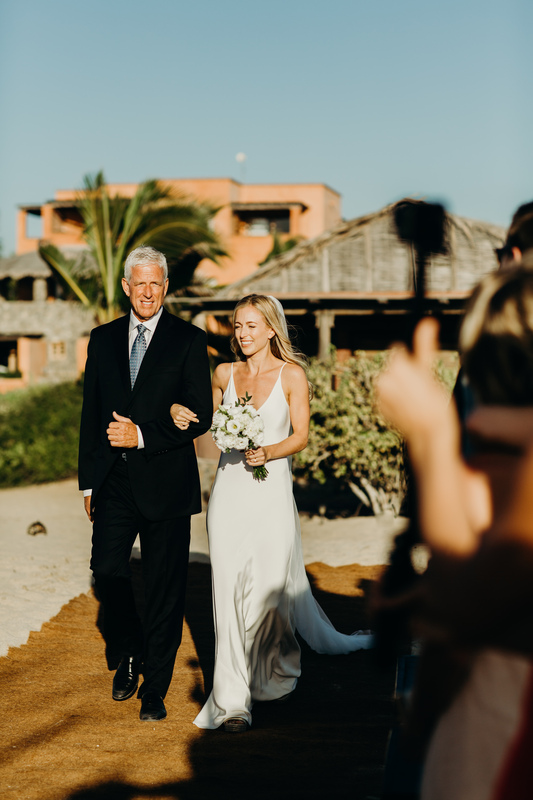 We here south of the border, in beautiful Cabo San Lucas, have rung in the New Year and are so excited to be introducing our brides and our local clients to some of the most stunning new trends for the year of 2017! 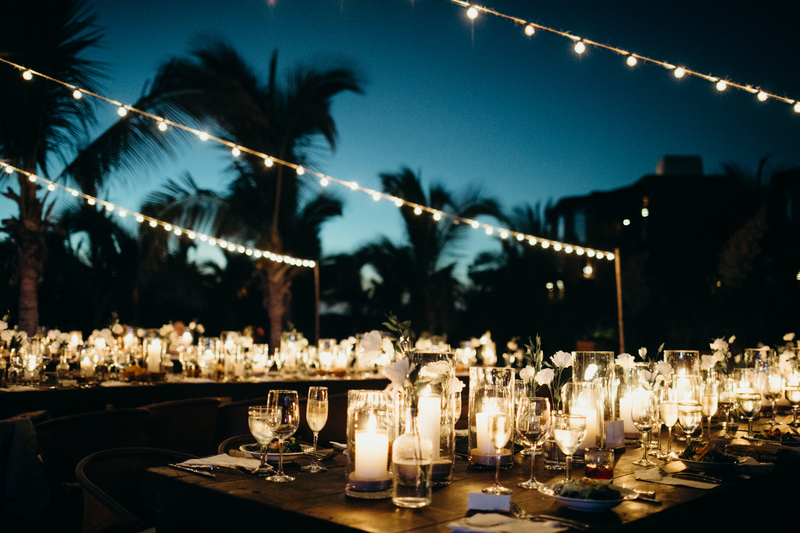 These are some ideas we know we’ll be seeing a lot more of at our Cabo weddings…and that we are thrilled about. 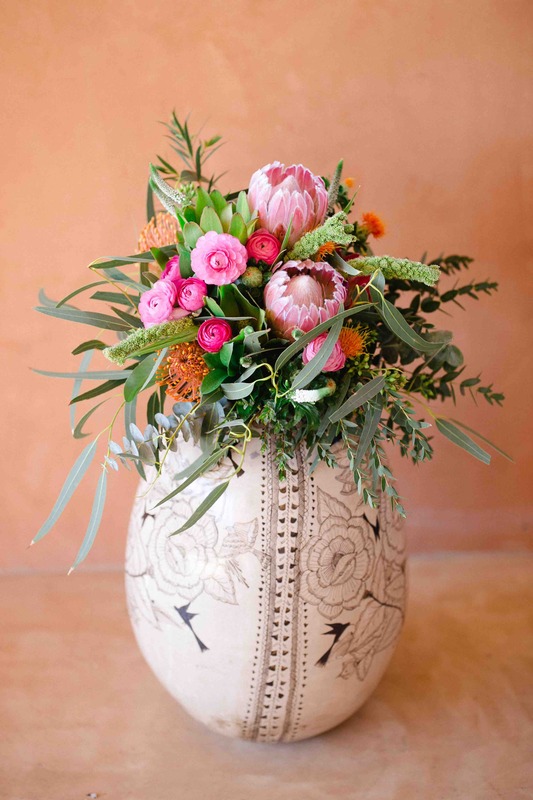 Can we help you, dear bride, include some of these great ideas into your wedding’s floral plan? 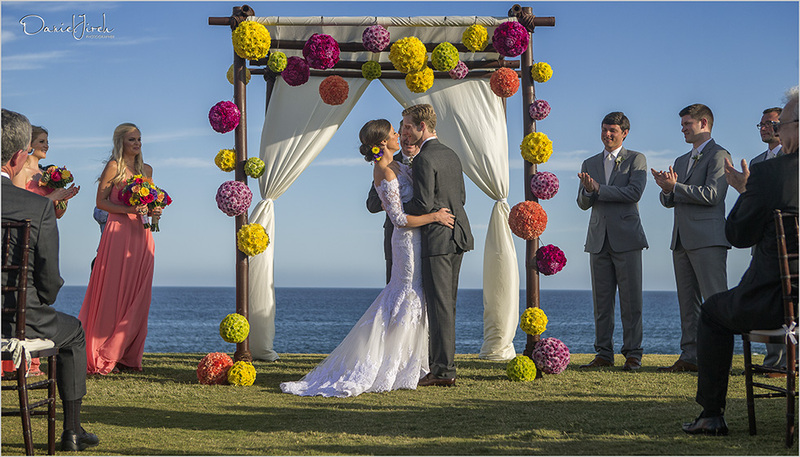 TREND #2: BRIGHT COLORS AS PART OF YOUR CABO WEDDING FLORAL PLAN. Color like: reds, oranges, & yellows. 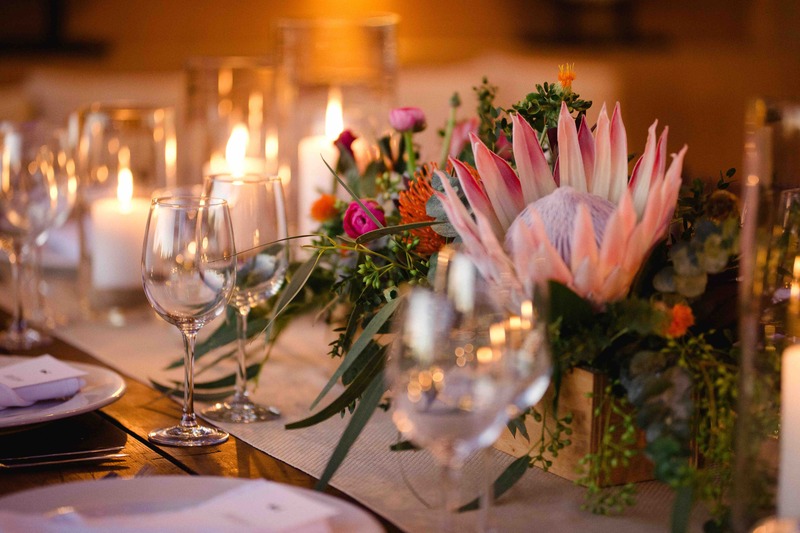 TREND #3: PROTEAS! 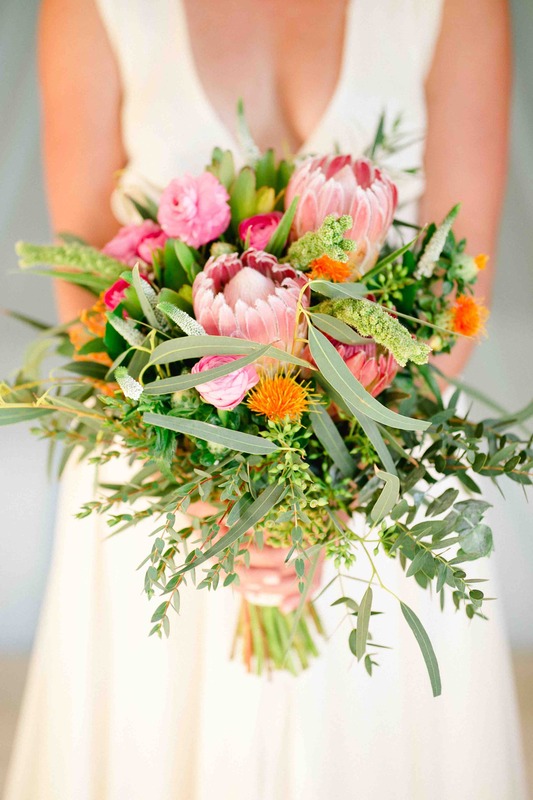 ALL KINDS OF PROTEAS! 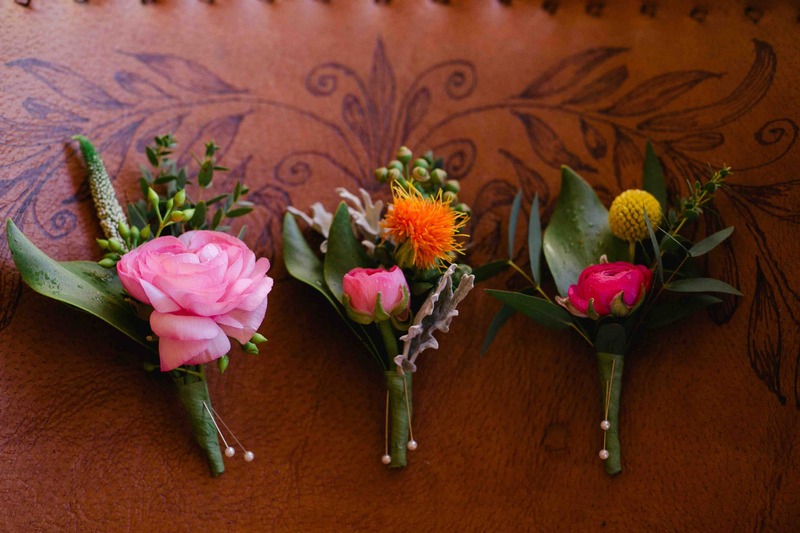 These funky and sassy flowers are the belle of the ball lately…and we love them! In bouquets and on tables! So have fun with your floral planning for 2017…and let us know what we can do to assist you! We are the #CaboFloralExperts! All flowers shown designed by Cabo Flowers & Cakes. 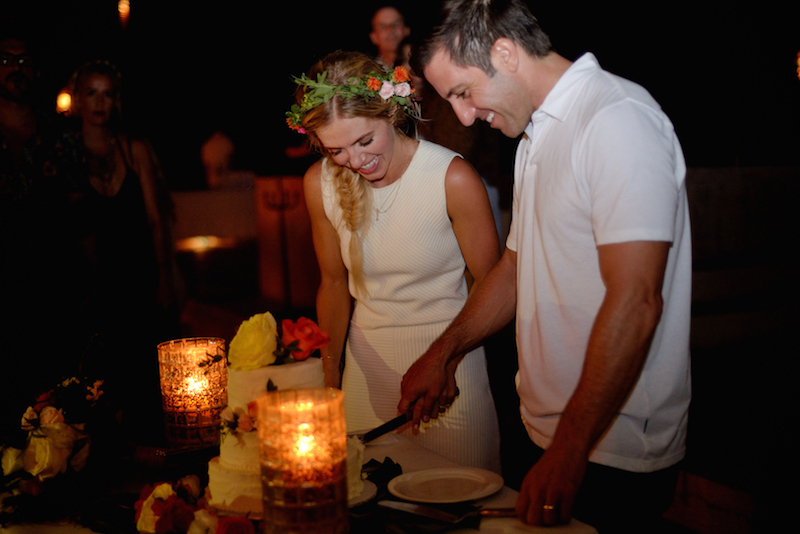 Our last Real Wedding post for our Cabo Flowers & Cakes blog for the 2016 year is one of our favorites! 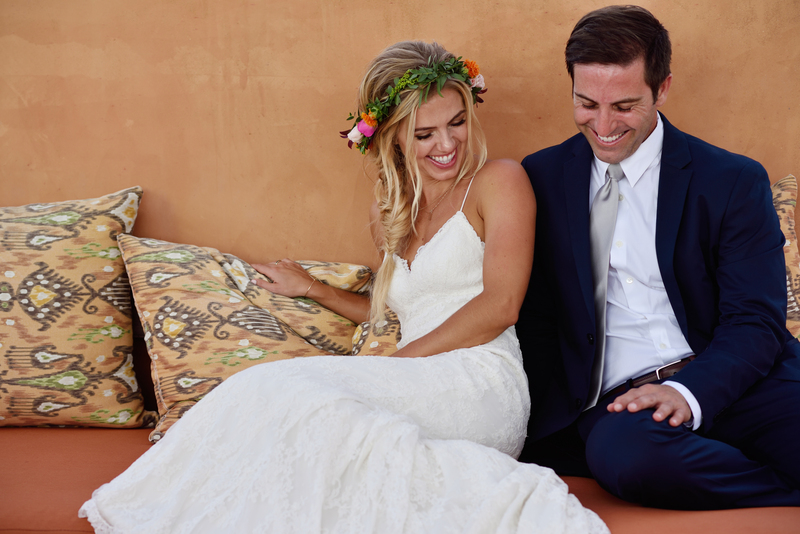 Our clients, Meredith & PJ, had such a memorable wedding at Rancho Pescadero…and so much fun! 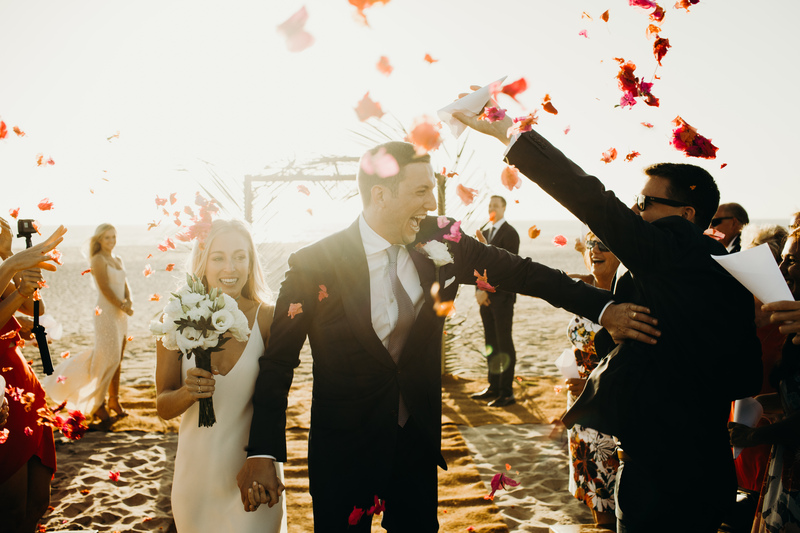 They were all smiles and their playful spirits showed through in their flowers choices as well! 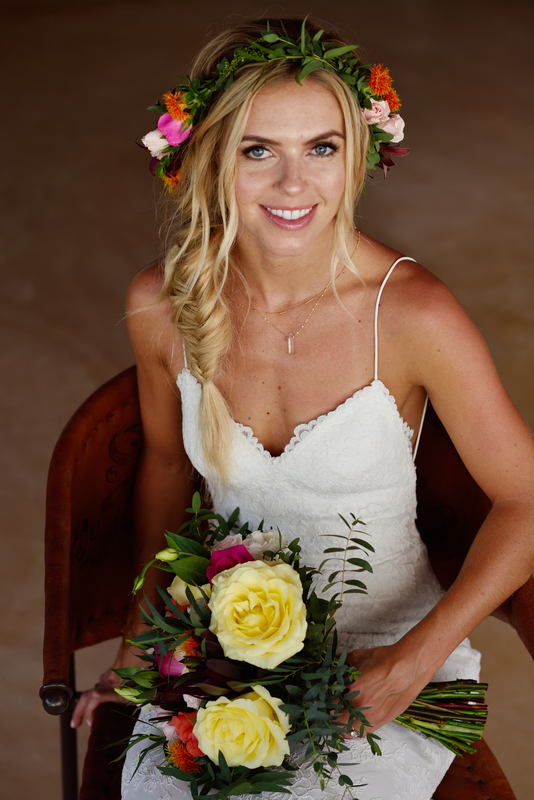 Meredith’s head wreath (a perfect fit with her loose braid) and floral bouquet were bright, colorful, whimsical and natural. 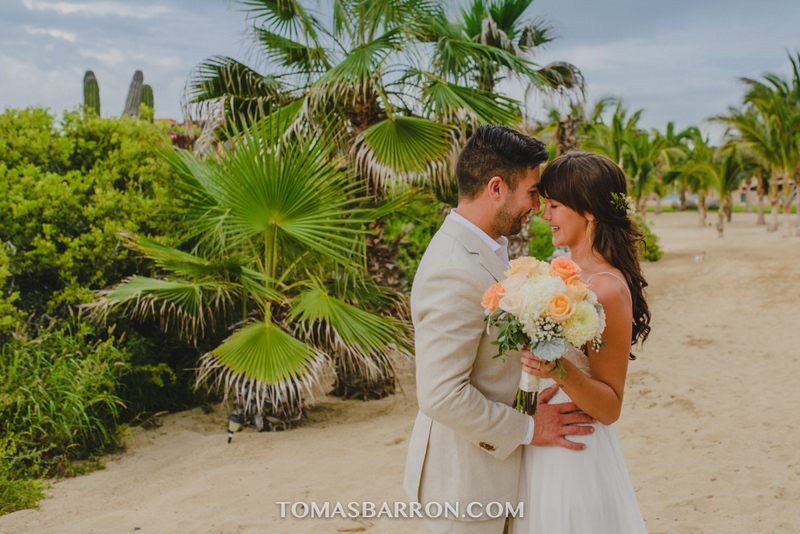 She didn’t want anything sculpted or too big; she wanted flowers that fit with the stunning environment at their amazing wedding location, Rancho Pescadero. 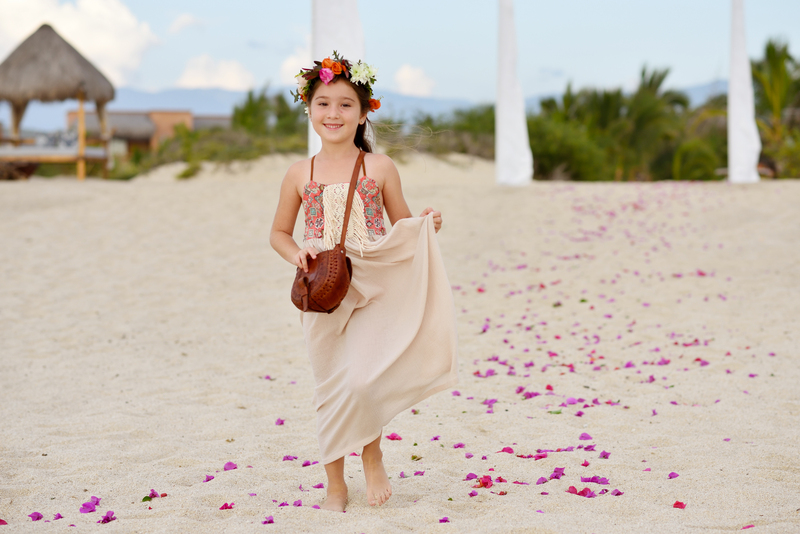 Meredith & PJ’s flower girl (with petals in her purse…so cute!) modeled another boho-type head wreath. We create our head wreaths with a special back enclosure so that each wreath fits each individual head perfectly! No bobby pins needed! We love the way Meredith is holding her bouquet…she wanted a casual look with her bouquet as she walked down the aisle. 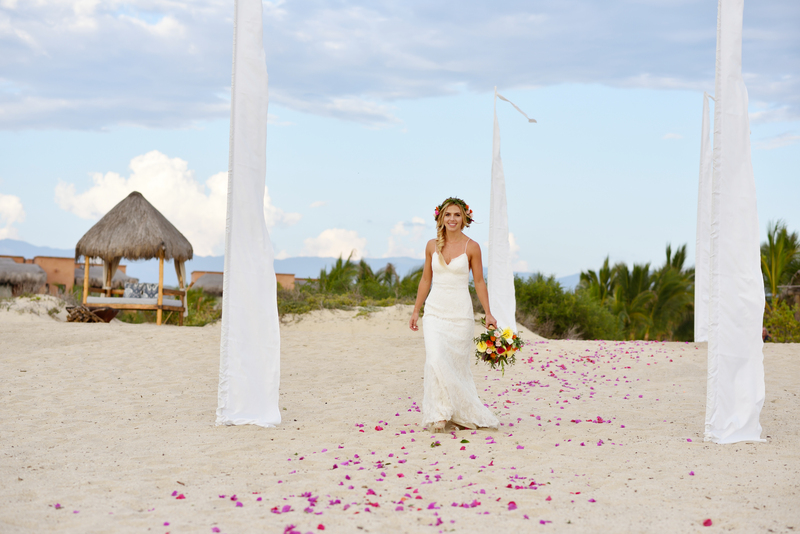 Nothing too rehearsed looking…just a easy stroll to her beloved. The white paper Mexican flags hanging here are called “Papel Picado” here in Mexico. 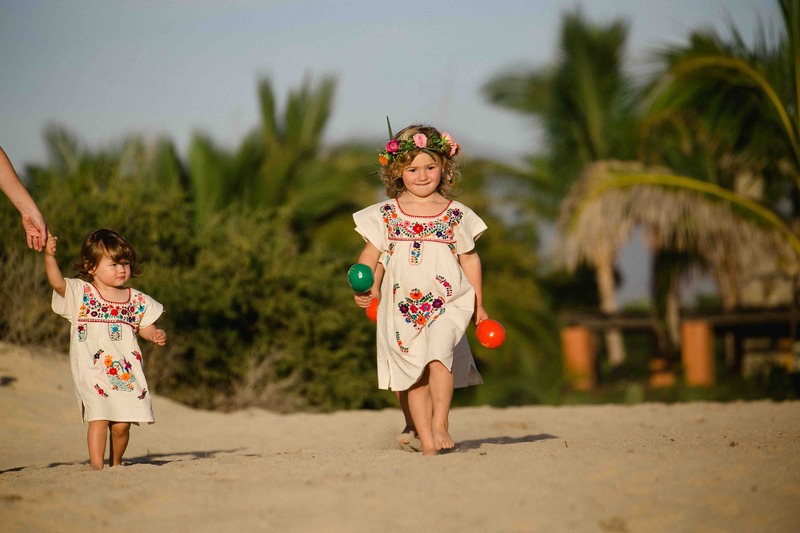 They are individually cut with beautiful and intricate designs, and are a popular addition to Mexican events. We carry them (in both plastic – more durable – and the traditional paper) and hang them as well. 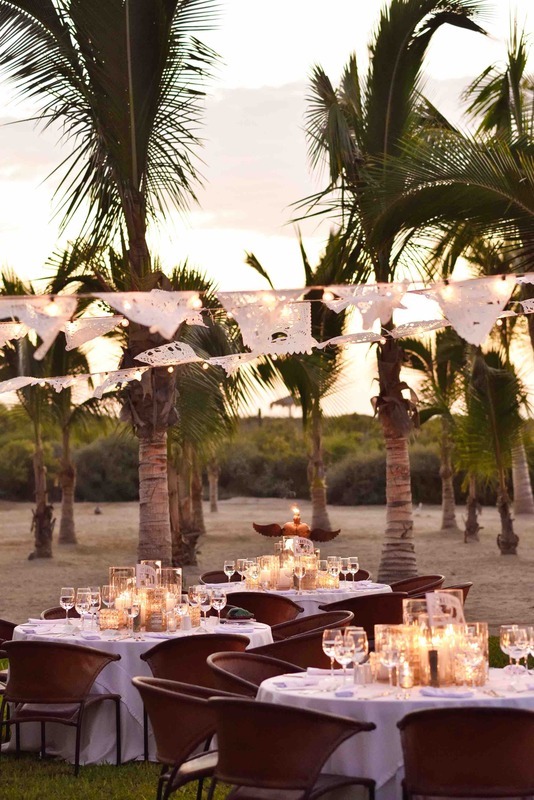 Make this a must-have for your Mexican wedding! Meet Crista & Patrice and their lovely families (and friends). 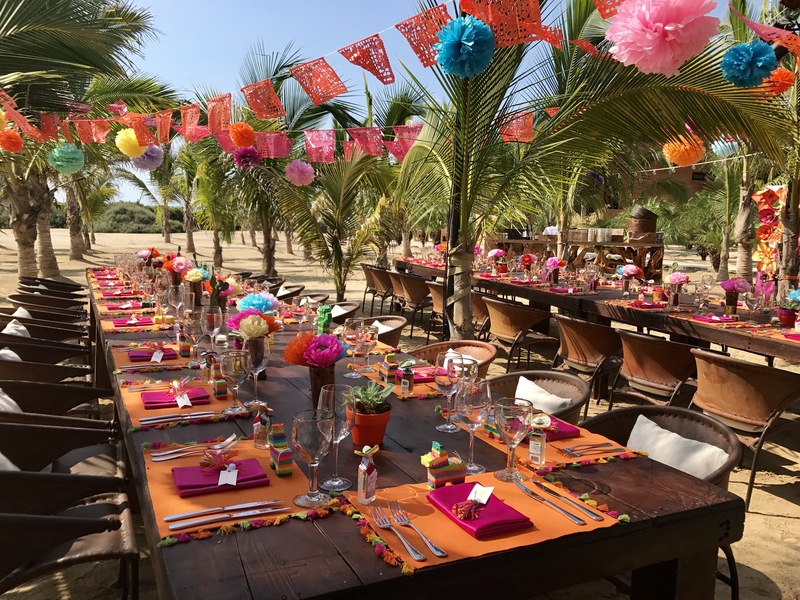 We are proud to be one of the exclusive floral providers at the amazing Rancho Pescadero, in El Pescadero, about an hour north of Cabo. We design the florals for almost all of their events! An eco-friendly boutique resort with a “namaste” vibe, the environment at Rancho (as the locals call it) is intimate and gorgeous! 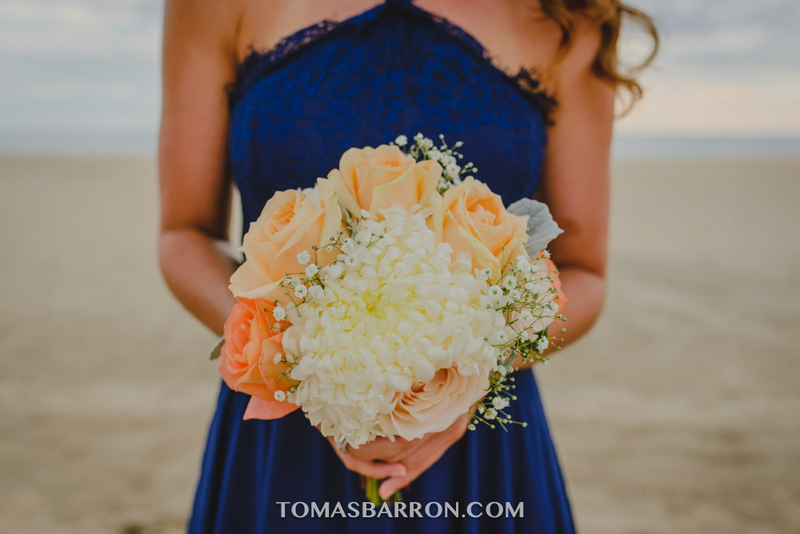 We created Crista’s bouquet to include colors that are familiar at Rancho…corals, and oranges, with subdued greens as well. 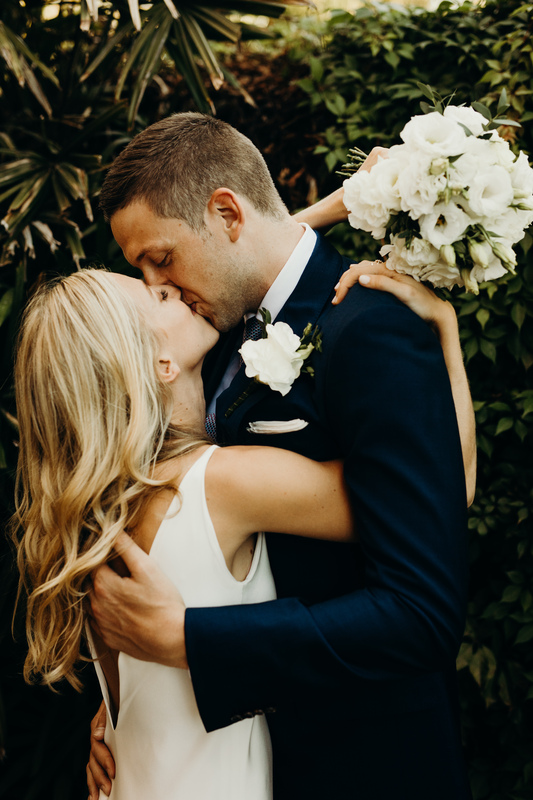 Crista loves big mums and those featured prominently (and beautifully) in her bouquets! 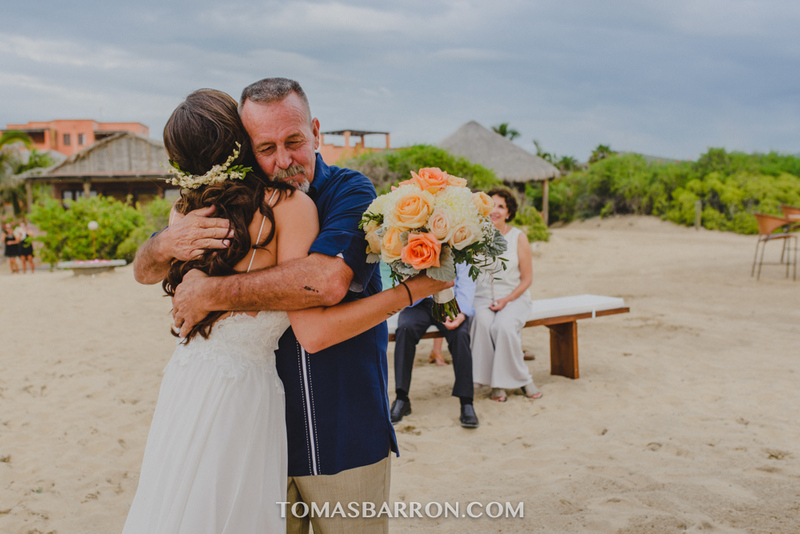 Rancho Pescadero has just recently started offering a smaller wedding package (up to 14 guests) and so, with just 12 guests, Crista had a bridal bouquet and one bridesmaid bouquet. Both were lovely! 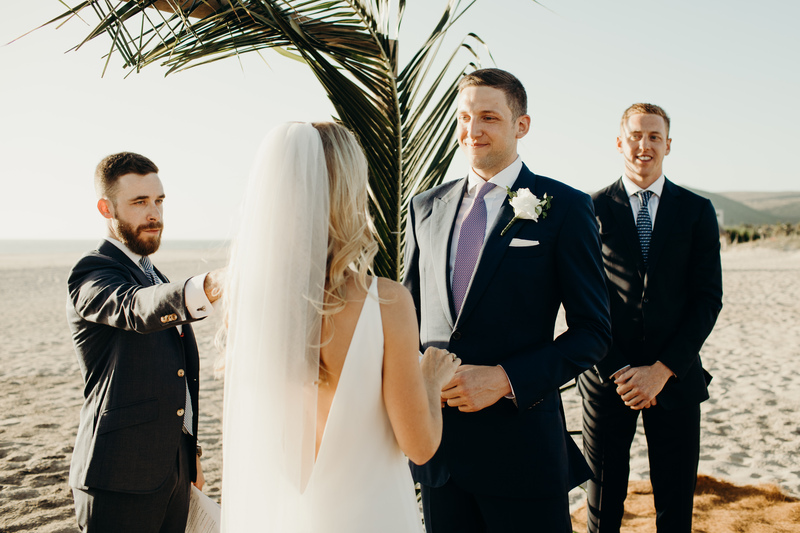 And the smaller wedding was such a memorable experience for all involved! 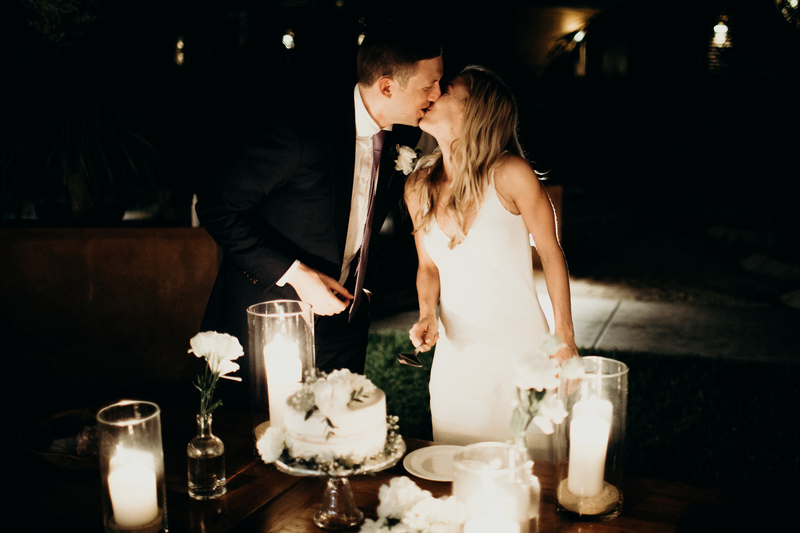 With one long table for all of her guests, we created a mix of florals in bud vases, cylinder candles and mercury gold votives, that glowed all night long! 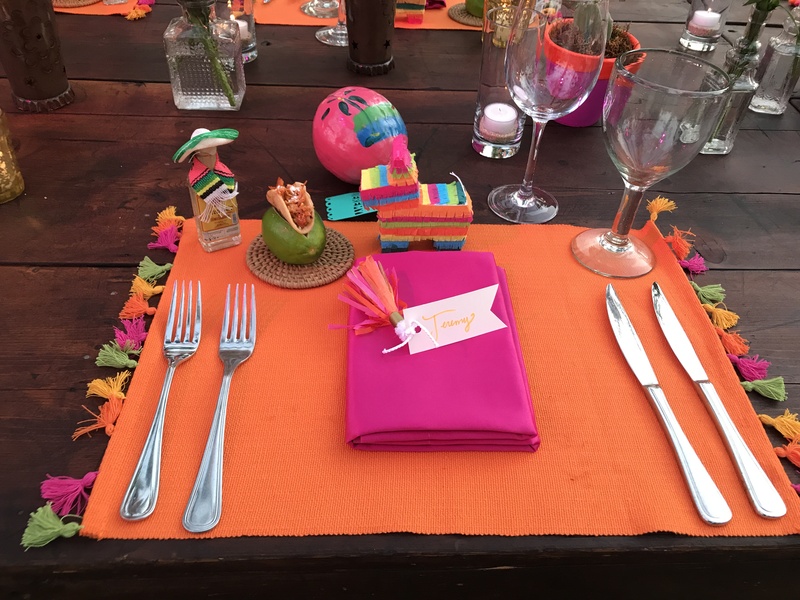 Rental tables, chargers and cutler provided by Lazy Gourmet Catering. 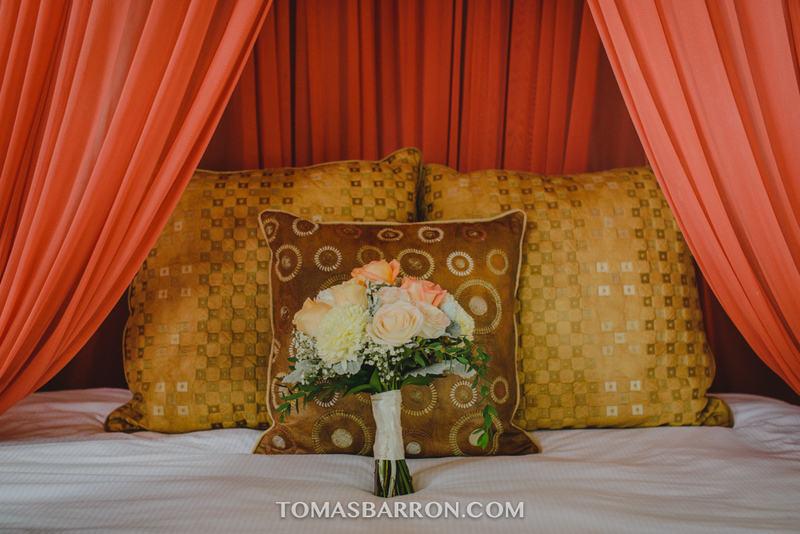 Wedding Photography by Tomas Barron.